A simple, scrumptious party pleaser that is warm creamy and delicious. 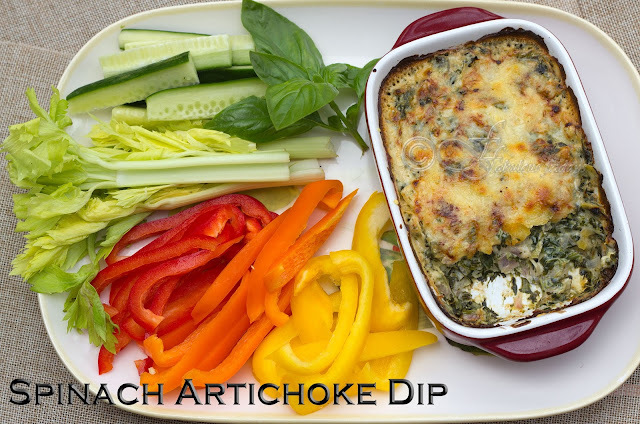 Filled with the goodness of fresh leaf spinach, artichoke hearts and cheese, this hot spinach and artichoke dip is a perfect appetizer for those super bowl parties, Thanksgiving table and New year potlucks. Dunk into this warm dip with tortilla chips, crackers, baguette slices, pita chips or an assortment of veggies. I always use fresh spinach for this recipe and I prefer to use bagged spinach as it is pre-washed and ready to go. Frozen will work just as well. Make sure to thaw it and squeeze out all the liquid before cooking. Also you can use any cheese combination that you like Parmesan, Romano, mozzarella, feta. Each will give a unique flavor to the dish. Roughly chop the spinach and keep aside. Heat oil in pan and saute onion and garlic till soft and pink, about 3-5 minutes. Add spinach and cook on high till it wilts and most of the liquid has evaporated. Now add chopped artichokes and stir till heated through. Transfer the mixture to a bowl. In the same pan whisk together milk and cream cheese. Warm the mixture but do not boil. Cook till you get a smooth concoction. Now add the spinach mixture in this along with grated pepper jack and half the cheddar cheese. Throw in the basil and season with black pepper and cayenne pepper. Taste to see if you need any salt and adjust as per your taste. If the mixture looks too thick then add some more warm milk to adjust the consistency. Pour the mixture in a greased baking dish and top with the rest of the cheddar cheese. Bake at 425 F for 20 minutes till lightly browned and bubbly. Serve with tortilla chips, crackers, baguette slices, pita chips or an assortment of veggies. 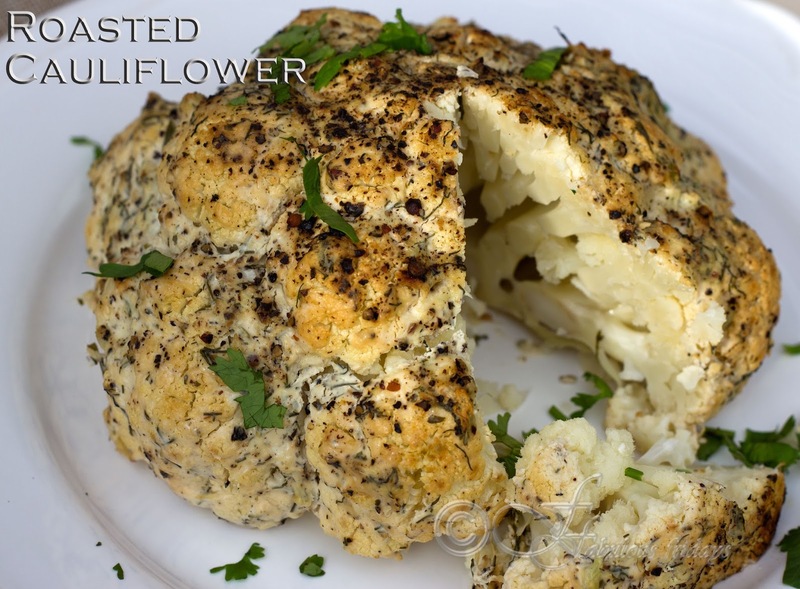 A whole head of cauliflower, beautifully roasted with herbs and spices, tender on the inside and crisp on the outside - a gorgeous and delicious way to serve cauliflower. This very easy to make and budget friendly dish is sure to please every palate. Impress all your vegetarian friends at the next BBQ party with this show stopper. 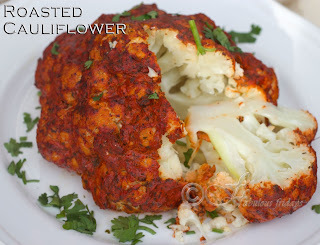 Personally I think the cauliflower will taste great with just salt, pepper and olive oil. But you can use your favorite ingredients to flavor this dish. Its like a blank slate, marinate with anything you like - tandoori marinade is just delicious, pesto would be wonderful, Za'atar seasoning will be out of this world. Here I have chosen 2 different flavors. The red head is flavored with tandoori marinade and the blonde one with a mixture of cheese and hung yogurt (see procedure below). Both turn out delicious. Serve with a bean salad or as is. To roast you can try one of two different procedures. Roast in the oven, tightly covered with foil to allow steam to cook the vegetable for about an hour or so and then broil to brown. 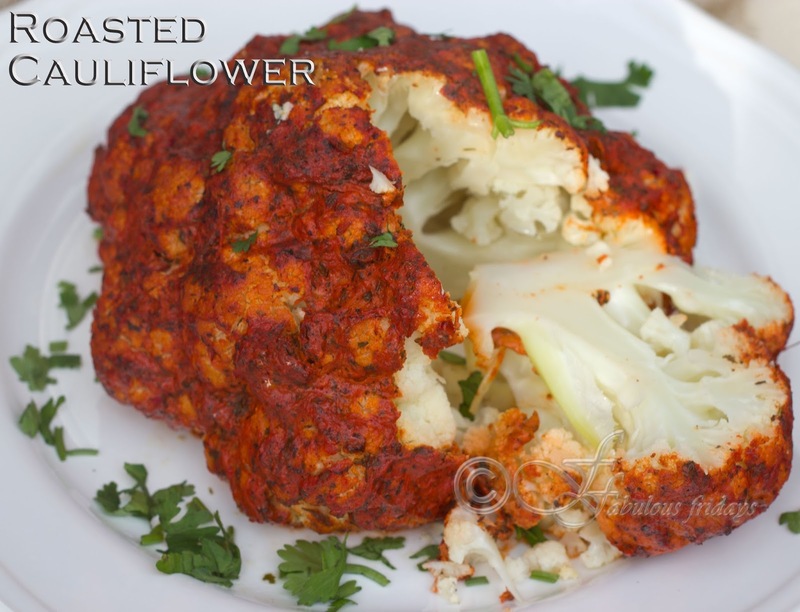 If you are short of time then first soften the cauliflower in the microwave. This reduces the oven time considerably. Both turn out great. Place a sieve lined with cheese cloth over a bowl. Put 2 cups of plain yogurt (yields 1 1/2 cups of hung yogurt) on the cheese cloth, cover and place in the refrigerator overnight (minimum 4-5 hours). All the water from the yogurt will filter out into the bowl leaving a thick creamy hung yogurt perfect for marinade or to use as a substitute for cream in any dish. Take a medium head of cauliflower and cut the stem near the base so it sits nicely. Wash and clean and drain well. Procedure 1 - place the cauliflower head in a ziplock bag and microwave on high for 3-4 minutes. Remove and cool completely. 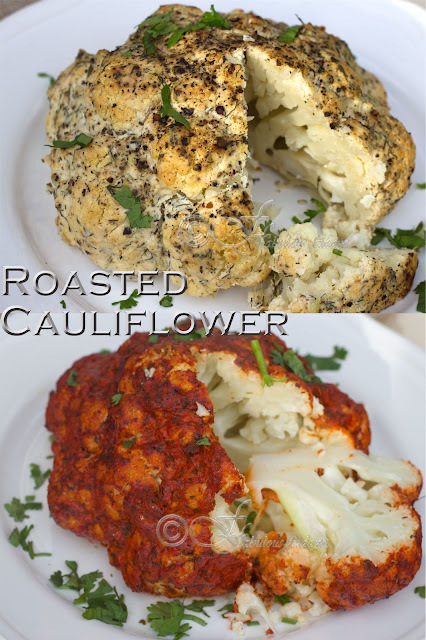 Preheat the oven to 375 F. Apply the marinade liberally in all the nooks and crannies of the cauliflower (I use my hand to do this). Bake covered for 15-20 minutes till cooked through. Broil for the last 7-10 minutes to brown the top. Procedure 2 - Preheat the oven to 375 F. Apply the marinade liberally in all the nooks and crannies of the cauliflower (I use my hand to do this). Bake covered for about an hour till cooked through. Broil for the last 7-10 minutes to brown the top. Sprinkle some fresh lime juice all over the head and garnish with finely chopped fresh coriander. Mix all the ingredients together and palm crush the herbs before adding. While the late evenings are graced with some warmth in the air and light in the horizon, it is only right to grab every last opportunity to enjoy the outdoors with a chilled drink and some tasty tidbits. This ten-minute-put-together spread makes for the perfect drinking partner. Tapenade is made with the saltiest of ingredients and pairs very well with the bold earthy Zinfandel, or the citrus Reisling, even Pastis (anise-flavored liqueur, particularly popular in Provence). Crackers or crostini are a must, but serve it with cheese (aged cheddar, or blue) for even more oomph. The principal ingredient is olives (traditionally small black olives are used) and I prefer to use the earthy Kalamata olives that have been preserving in oil. The other salty ingredient and an important one is capers. Capers are salty, pea-sized dark green pickled flower buds. It’s a good idea to rinse them first, to remove all the excess brine. Anchovies are also a must. I omit these as there are a few vegetarians in the house. But if you have no such restriction add 2 small anchovies to the recipe below. Make sure to rinse off excess salt first. We love garlic and so in it goes. You can reduce the quantity if you are not such a fan as it does tend to over power the flavor. Traditional recipe calls for parsley as the principal herb but I like to use rosemary with its woodsy scent. The twang comes from fresh lime juice. Balsamic vinegar also goes well, so take your pick. I love to add a bit of walnuts to enhance that nutty earthy flavor. It adds the nuttiness as well as a slight texture. I use my mortar and pestle to blend all these together as I like my tapenade a bit chunky. You can also chop everything all rustic-like if you prefer. If you like a fine texture then pulse a few times in your food processor. 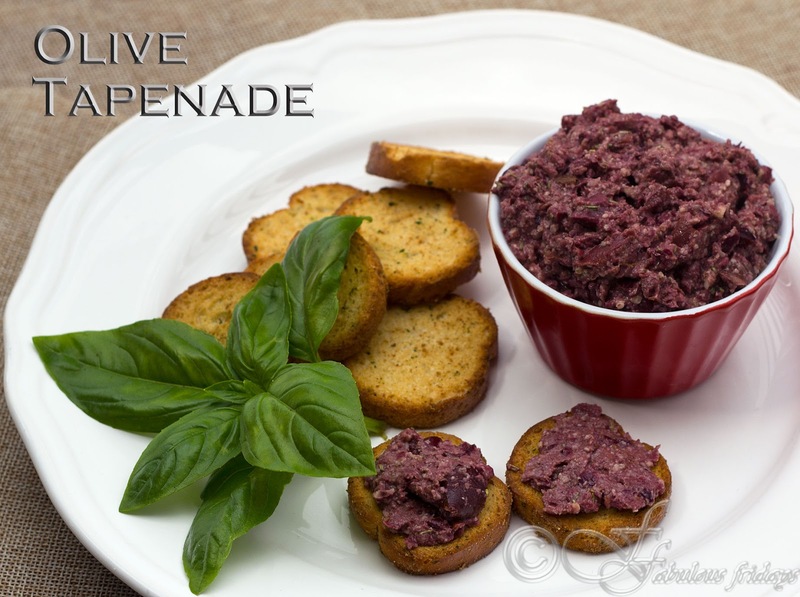 Tapenade is very versatile and can be used in many ways rather than just as a spread on crackers. Spread it on a sandwich instead of mayo, dollop onto a hard boiled egg or in between an omelette, spread on your toast in the morning topped with sliced avocado, toss it in pasta with chunks of feta cheese mmmm yummm, stuff in between chicken breast or thighs before roasting. Anyway you use it, this spread won't last long. Combine olives, capers, walnuts, garlic and rosemary in a food processor. Pulse until all the ingredients mash up enough to form a thickish paste, but you should still see small pieces of walnuts and olives. Mostly I use my mortar and pestle to do this as I like my tapenade a bit chunky. If you prefer a finer consistency pulse a few times more in your food processor. Add rosemary and season with lime juice and pepper. Drizzle olive oil over the mixture and combine to form a spreadable concoction. 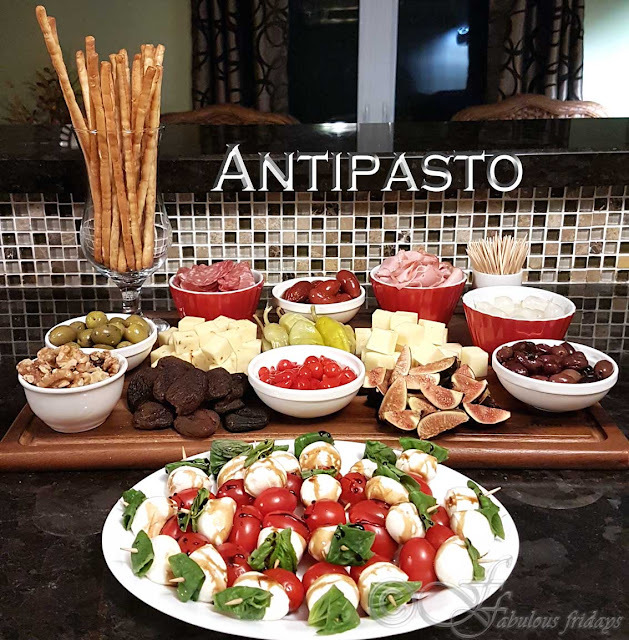 Serve as a dip or spread with crostini or crackers. I also love it on my toast for breakfast. Store in the refrigerator in an air tight container for up to 10 days. 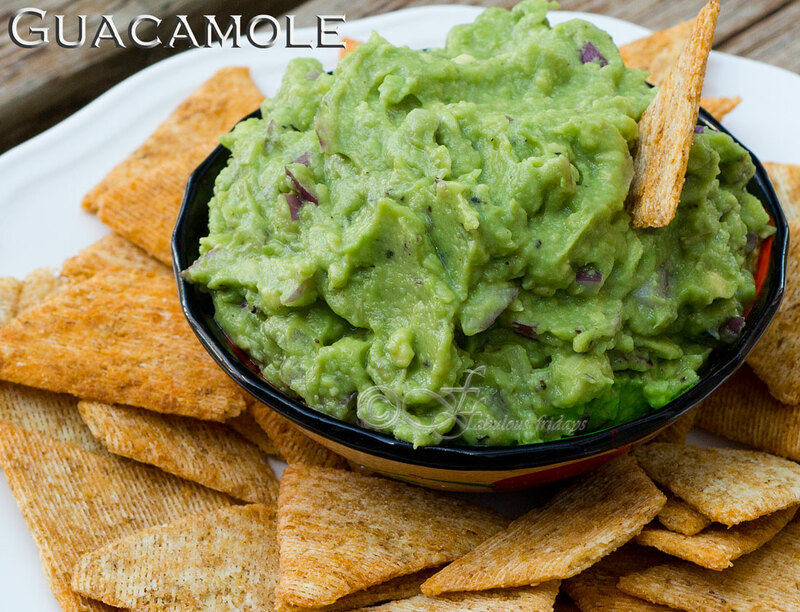 You may already have a favorite guacamole recipe. But I thought why not share one of my favorite. I love avocados, they are so delish and so good for you. The trick to a good guacamole is to not mash the avocados thoroughly, but leave it chunky. Then create a perfect balance of salt and lime juice, add some red onions and there you have it. if you like your's spicy, add some diced jalapeño, I always do. Some add diced tomato. I am personally not a fan of adding them to guacamole, I like mine crunchy. Essentially all you need is some salt and lime juice, that makes it plenty delicious. But here is the basic recipe that I use. Serve as a dip with crisp crudité, dollop into fajitas, quesadillas, tostadas or burritos. So quick and easy, so festive, great for your next party. Peel and pit the avocado. Place the pulp in a bowl and mash it coarsely with a fork leaving some large chunks. Add lime juice, salt, pepper, cilantro, red onion, garlic and mix thoroughly. If you are serving this at a later time, cover tightly with plastic wrap so no air gets on it to keep the guacamole from turning brown.